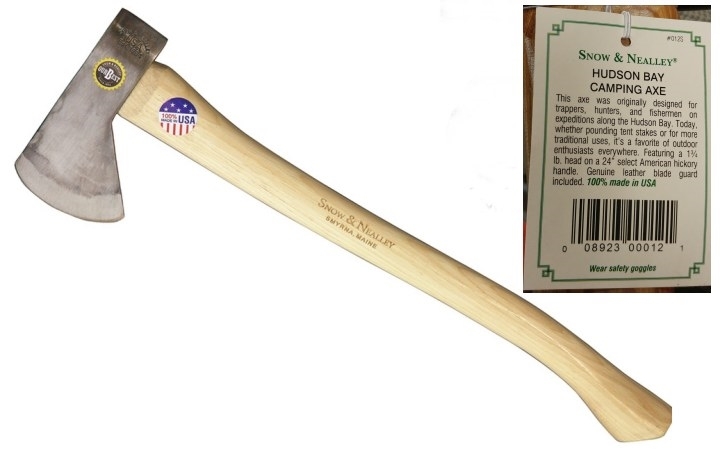 The most popular Snow & Nealley sportsmen’s axe has always been the Hudson Bay Camping Axe, with a 1¾-lb. head and a 24-inch hickory handle. Total overall length including the head is 23 1/4". Originally designed for trappers, hunters, and fishermen on expeditions along Canada’s Hudson Bay, it is light, well balanced, and perfect for cutting smaller wood and pounding stakes. Long a favorite of trappers, it is also called the Hudson Bay Trapping Axe. 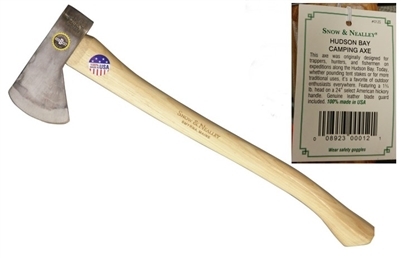 Snow & Nealley axes are still 100% American made, and the same drop-forged, high carbon steel heads are still hand-tempered, ground, finished, and fitted to select American Hickory handles in Maine. Six generations of skilled tool crafters have kept them the highest quality axes available. The Snow & Nealley Hudson Bay Trapping Axe is not only a practical tool, its heirloom quality and heritage makes it perfect to pass on to the next generation, or keep as a collectible.